The lines separating the mayor's nonprofit and the mayor's political ambitions are pretty blurry. Technically, the mayor has nothing to do with One San Diego. But the branding matches his political campaigns, the nonprofit is run by his political allies and his wife is its "honorary chair." Everybody was on the list earlier this month when Mayor Kevin Faulconer headlined a fundraiser for his new charity. There was Bank of America, Cox, Sempra Energy, Wells Fargo, Pardee Homes and many more. Those powerhouse companies were named as partners and event sponsors for the fundraiser for One San Diego, the nonprofit created soon after Faulconer took office last year. All frequently have business interests tied to City Hall decisions. And yet, none of the companies’ donations – not the amount nor when they were given – has been made public, and it’s unlikely they ever will be. The donations aren’t subject to the strict disclosure laws that govern campaigns and City Hall lobbying because they’re not for campaigns and City Hall lobbying. But it’s impossible to miss the close ties between One San Diego and the efforts to boost Faulconer’s standing in advance of his re-election bid next year and any future run for higher office. The people who donate to One San Diego certainly know this, said Richard Hasen, a law professor at UC Irvine and expert in campaign finance. “There are always people with interests before the city who are always happy to give to civic purposes and also curry favor with elected officials,” Hasen said. Indeed, the lines separating the mayor’s nonprofit and the mayor’s political ambitions are pretty blurry. 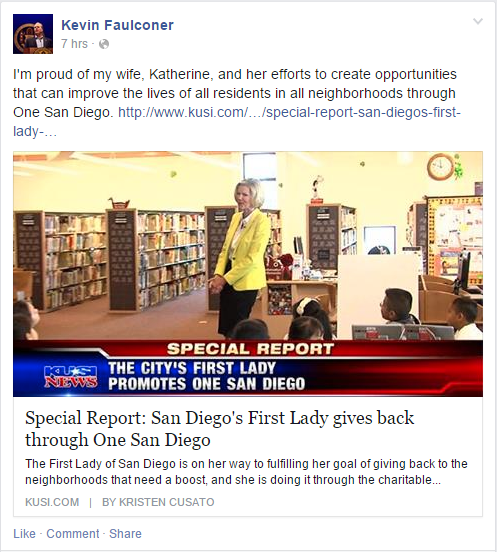 One San Diego is the mayor’s nonprofit. But it also isn’t. Last November, Faulconer announced the creation of the nonprofit at a press conference in Logan Heights and the first effort One San Diego would support: an after-school program. The charity was new, but the name wasn’t. “One San Diego” is the brand Faulconer has been pushing since he was elected in February 2014. The phrase appears in his official biography. His staff has included the phrase in 57 different official press releases over the past year. When the mayor’s press team announced his involvement in the recent One San Diego fundraiser, it put the logos next to each other. Technically, though, the mayor has nothing to do with One San Diego. And that matters, for legal reasons. He’s not on the charity’s board of directors and neither are members of his staff. The board is made up of Faulconer allies, including its chairman, former City Council President Tony Young. Disclosure rules say that Faulconer only has to make public donations to the group that he specifically solicited himself. Faulconer recently disclosed that he asked for $30,000 in donations to the charity. The donors, as the San Diego Reader noted, included $5,000 from Cisterra Development, the company that just made a big real estate deal with the city for property next to City Hall. Total donations to One San Diego since it started total about $250,000, said the charity’s director, Barbara Ybarra. Young and Ybarra said the charity won’t disclose information about its donors beyond what’s required by law. “We’re going to just focus on abiding by the letter of the law,” Young said. One San Diego was created to support low-income communities in the city. But it can also do things that sound a lot like campaigning. During his campaign and while in office, Faulconer has emphasized his support for neighborhoods south of Interstate 8, which are typically poorer than northern communities. The charity’s actions so far reflect that, Young said. Money from One San Diego is going toward college-prep centers in city libraries, 60 new laptops for the Logan Heights library and a community forum in City Heights. “The mayor really wants to help these communities,” said Young, who represented southeastern San Diego when he was in office. But the charity’s incorporation papers say it can do much more than that. In them, One San Diego says it envisions paying for polls on public policy issues, town hall meetings and voter information guides. And even if the mayor’s city staff isn’t involved with One San Diego, people close to campaigns are. The mayor’s political fundraiser Ashley Hayek is also One San Diego’s fundraiser. Elections lawyer Jim Sutton is the one who officially incorporated the charity. One San Diego isn’t allowed to spend money on specific candidates or ballot measures. But that doesn’t stop it from doing things like polls and voter guides so long as they’re non-partisan. “Trying to draw the line between where informing voters ends and electioneering begins is a perpetual problem,” Hasen said. Ybarra, One San Diego’s director, told me that the charity has no plans to finance polls or voter guides despite what it says in its incorporation papers. The mayor isn’t the only one who has a fuzzy connection to the nonprofit. Earlier this month, television station KUSI did a feature on the mayor’s wife, Katherine, who works as an event planner downtown. The story focused on Katherine Faulconer’s increasing involvement in One San Diego. It opened with her presenting a big novelty check with One San Diego’s name on it to a community project. The mayor highlighted the piece on his Facebook page. But despite all this, the mayor’s wife, Young and Ybarra said, has no official role with the charity. She’s not on the board, not a staff member and not a paid consultant. She’s just involved, they said. “With her great knowledge of the city’s communities, she will help us identify needs throughout the city,” Ybarra said.